The “White Papers on Terrorism in Morocco” is one of the first documented and explorative study in an attempt to understand the phenomenon of terrorism in Morocco since its inception to the present. Nevertheless, the analytical dimension of the book was evidently present by examining interconnectedness between domestic terrorism activities and regional and international geostrategic environment. This book has adopted the definition terrorism based on recognized definition widely acknowledged in international law and international relations. This approach was necessary to highlight how terrorism was carried out in practice through screening extermination and exclusion with a religious language that have affected the image of Islam and raised the threshold of the civilizational tension between the West and the Arab-Muslim world. This work has devoted special attention to the analysis and tracking of the various modes of indoctrination and cognitive as well emotional manipulation used by terrorist organizations to convert its members to to passionate actors; who are able to defend a political project that deprives the right to life and values of coexistence and eliminates the “other” irrespective of gender, race or religion. Back to the model of Morocco, the book highlights concretely that the phenomenon of terrorism is not the result of the attacks of May 16, 2003; but can document its birth within the inner dynamism of the “Shabiba al-Islamiya” which was in favour exclusion and violence all those who opposed its ideology or its exclusionary style. If the assassination of a Moroccan left wing leader has contributed in dismantling what was supposed to be “an association of preaching” , it has opened also the door to what the author of the book calls the “cycle of fragmentation”. Arguing that “the Mujahideen movement in Morocco”, the “Moroccan Islamic Combatant Group” and the “Islamic Choice” were the offspring of the ” As-Shabiba al-Islamiya ” that provided a framework for many cells. The book does not ignore the external influence on the increased risk of the terrorist phenomenon, but it exhaustively analyze it from the perspective of the review of the role of Moroccans who fought in Afghanistan and Bosnia and later in Iraq in feeding domestic threats of terrorism. The fact that hundreds or even thousands of Moroccans have been mobilized to fight in the conflict zones of the Sahel, Syria, Iraq and Pakistan-Afghanistan region is extremely alarming. They have developed fighting know-how that they aspire to reproduce when they return back home. The decision of many of them to move to fight was a consequence of the tight siege imposed by the preventive and anticipatory policies in Morocco. All the cells that were dismantled had as a goal to set up, in vain, camps in the mountains and countryside inspired from experiences in Algeria. The researchers came to the firm conviction that the effectiveness of the Moroccan counterterrorism strategy lies in its proactiveness and multidimensionality. The most important ingredients in the Moroccan Alchemy of the counter-terrorism policy was the security energetic efforts combined with the restructuring of the religious field, backed by a social approach making the human at the centre of development to fight vulnerability and marginalization. The dismantling of more than 130 terrorist cells since 2000 constituted a rich data for researchers that allowed them to reach conclusions based on facts. First, it disregards several interpretations – which remained justification rather enlightenments-, and consider most of the suicide bombers of May 16, 2003 coming from poor backgrounds, and cause consequently to the misconnection between terrorism, poverty and marginalization. However, reviewing the list of those involved in terrorist acts after May 2003, the book attempts to put an end to the projective approach as long as most of them belonged to stable or even high social classes. Moreover, most of those convicted in terrorism cases began their practices with the “violent punishment” in the concept of the “Prevention of Vice”. Therefore, moral scruples are often the entrance to the excommunicating and eradicating approach leading inevitably to legitimize the systematic and organized violence. In this context, the path of terrorists shows that most of them were following progressive steps via organizations that, in turn, escalated gradually in their intellectual and political project, which highlights the need to open a debate on the relationship of extremist thinking with the intellectual foundations of the terrorist acts. The researchers also remark the weakness of regional cooperation in the war against terrorism despite its acute risks. Thus, the book analyzes the situation in the Sahel, noting the limited results of the “Serval” operation in Mali, linking terrorism and organized crime in this region, as well as the risk of the phenomenon to all neighbouring countries with no exceptions. It is also undoubtedly proved that several members of Front separatists “Polisario” that imbibed this thought joined organizations such as “Al-Qaida in the Islamic Maghreb” and “MUJAO”, which raises the liability of the host country. Starting from the principle of international law hung up the responsibility of States, the regional and global dimensions of the phenomenon of terrorism are used, by researchers, to understand the occurring developments, which is actually present in the fieldwork of the Moroccans security services that contributed to the defeat of many of the impending operations in many countries. 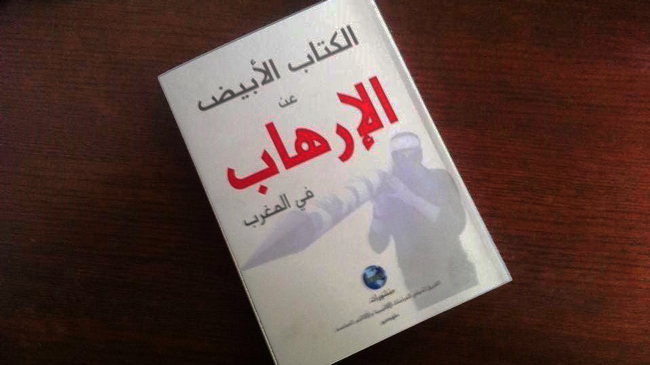 The “White Book on Terrorism in Morocco” highlights, as well, the functioning of the methods of the terrorists and the indoctrination using audiovisual media and the exploitation of modern technology as Internet, and then the way to prepare and train individuals to accept their self-destruction to injure others. The book also shows the chronology of all the terrorist cases before the Court of Salé, demonstrating their terrible plans to destabilize the country by targeting worship places, symbols of the state and its sovereignty, public figures and touristic and economic infrastructures and Western interests, especially American ones. This documented chronology in itself constitutes in its richness a reference for all researchers and observers interested in the phenomenon of terrorism as it extends for a period of up to fifteen years. In conclusion, the “White Book on Terrorism in Morocco” calls for, facing the globalization of terrorism threats, a genuine international coordination not only at the security level, but also at multiple levels to dry up the sources of the phenomenon. This call is based on accurate data and a sober analysis of a phenomenon that threatens all countries and all communities without discrimination. This coordination cannot dispense with Morocco’s outstanding experience in the fight against this phenomenon. For all these reasons, and considering the book as a unique reference of its kind, the ITEAS decided to publish this work in Arabic, English, Spanish, French and Japanese versions, to introduce its views and fact analysis to all specialists, which can Approximate visions related to the events and the facts and might contribute to the design of common strategies, on the basis of both the premise that share-knowledge between researchers and the generosity of exchange of data intelligence sharing between states , as one of the most important steps for the fight against terrorism. The international Research Group For Transregional studies and emerging Area Studies.Tokyo. The international team of regional studies and emerging regions is an independent scientific group that was created in 1997 at the Institute of Oriental Studies of the University of Tokyo by a group of Japanese and foreign researchers who were working on new phenomenon that require a distance from both classical social sciences and Area Studies. Terrorism and religious reform –forthcoming-Asian investment in alternative energy and environment industry in Africa –forthcoming.